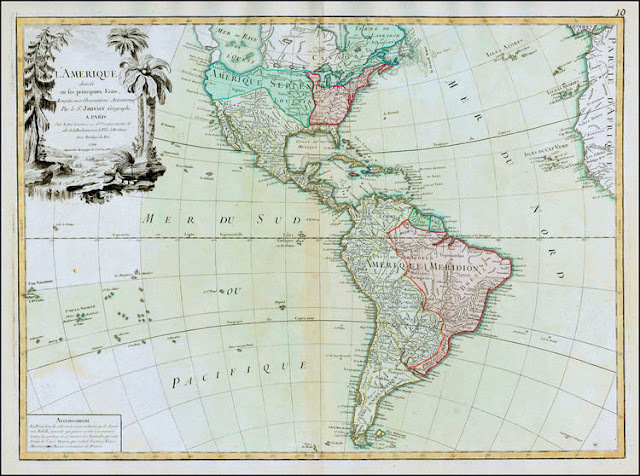 The images above are the continent of "L' Amerique" mapped by by Jean (aka Robert) Janvier, a Paris-based cartographer active in the 18th century. By the late 18th century Janvier was awarded the title of "Geographe Avec Privilege du Roi" and this designation appears on these maps. Janvier worked with many of the most prominent French, English and Italian map publishers of his day. The map at the top was completed and sold in the 1760's before the Revolutionary War, the one at the bottom in 1790, during the first year of the United States government. From the maps one can see that to the west of the continent of "L' Amerique" is the "Mer du Sud ou Mer Pacificque." 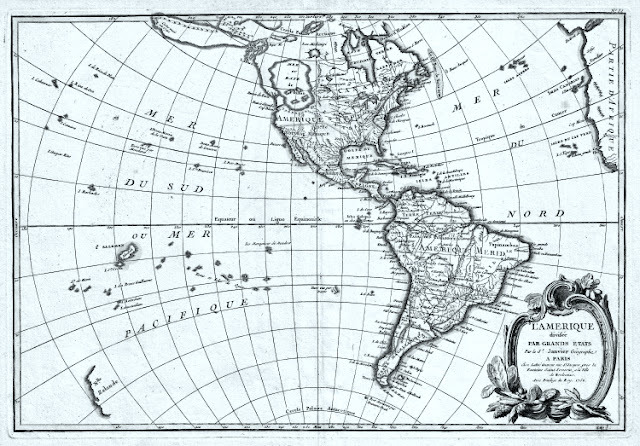 While Janvier didn't see a need to provide the name for the "Mer du Nord" (Atlantic Ocean) on the map, he found it necessary to provide the name of the Pacific Ocean. Effectively, the Pacific Ocean did not exist for Europeans prior to the 16th Century. And in the 16th, 17th, and 18th Centuries (1500's through the 1700's), it was not important to Americans as well as to most Europeans other than the Spanish. Though the peoples of Asia and Oceania have traveled the Pacific Ocean since prehistoric times, the eastern Pacific was first sighted by Europeans in the early 16th century when Spanish explorer Vasco Núñez de Balboa crossed the Isthmus of Panama in 1513 and discovered the great "southern sea" which he named Mar del Sur (in Spanish), a designation indicated on the maps above. However, it was Portuguese explorer Ferdinand Magellan who in 1521, during the his circumnavigation of the world on behalf of Spain, upon encountering favorable winds named it Mar Pacífico, which in both Portuguese and Spanish means "peaceful sea." 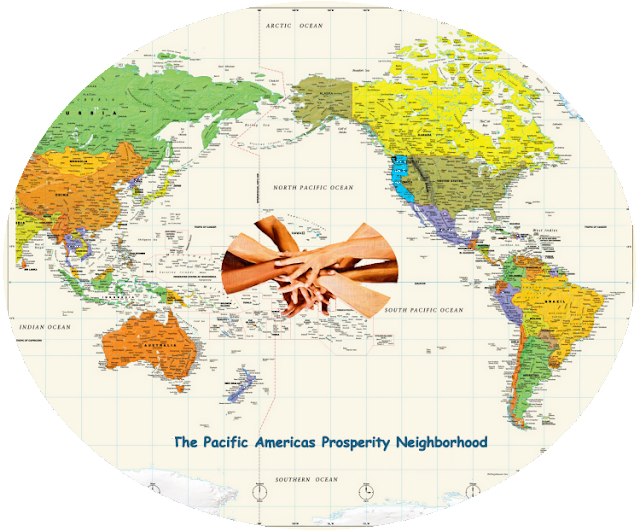 The word "pacific" derives from the Latin pācificus meaning "peace-making." During that 1521 voyage, Magellan "discovered" the Philippines and claimed them for Spain. ...because in November 1762 in the secret Treaty of Fontainebleau, France handed over Louisiana and the Isle of Orleans to Spain. Over the years, this treaty was contested. But the point of presenting this map is that in 1789 those in the United States had no claim nor apparent interest in the land along the Pacific Ocean. In fact, the United States had no coastline on the Gulf of Spain - what we now know as the Gulf of Mexico. On October 1, 1800, First Consul of the Republic of France Napoleon Bonaparte, reacquired Louisiana from Spain by the secret Treaty of San Ildefonso. To the distress of the United States, Napoleon held title to the Mississippi River and the port of New Orleans. Another concern was whether it was proper to grant citizenship to the French, Spanish, and free black people living in New Orleans, as the treaty would dictate. Critics in Congress worried whether these "foreigners", unacquainted with democracy, could or should become citizens. Slaveholder President Thomas Jefferson placed a special importance on declaring U.S. total sovereignty over this land occupied for centuries by the many different indigenous Native American communities. Immediately after the Louisiana Purchase he commissioned fellow slaveholders Meriwether Lewis and William Clark to carry out the Lewis and Clark Expedition; the three year Corps of Discovery Expedition (as it was known then) crossed the Transcontinental Divide of the Rocky Mountains, camping near the Pacific Ocean in the winter of 1805-1806. The faithless and treacherous character of those at the head of our Indian enemies appear now to be so well known and understood, as to permit the expression of the hope, that their wanton cruelties will eventually result in their own destruction; and aa they have afforded sufficient evidence not only of their entire disregard of Treaties, but also of their deep-rooted hostility in shedding the blood of our women and children, a War of Extermination should be waged against them. The honor and respectability of the Government requires this: - the peace and quiet of the frontier, the lives and safety of its inhabitants demand it. At that time there were still conflicting claims on the area designated as "Oregon Country." However, despite having fought the Revolutionary War and the War of 1812 against England, the area of what are now the states of Oregon and Washington were included in the Oregon Territory, initially defined by the Treaty of 1818 that set up a "joint occupation" between the United States and the British over the region. In 1848 the Oregon Territory became an organized incorporated territory of the United States. 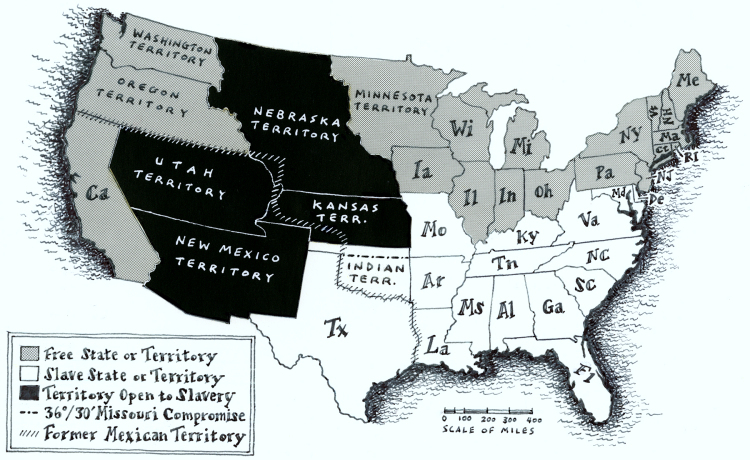 The Washington Territory was split off in 1853. 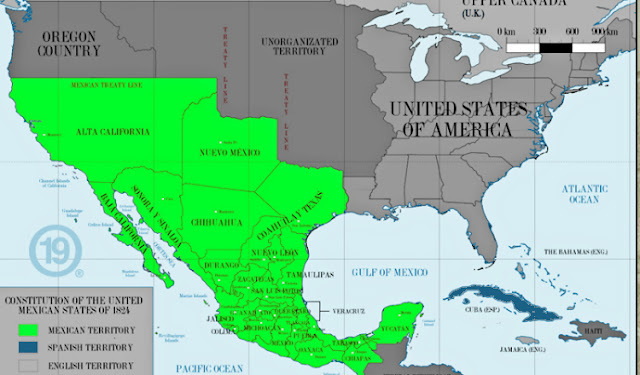 California was part of Mexico for 27 years until the Mexican-American War beginning on May 13, 1846, ending with the Treaty of Guadalupe Hidalgo in 1848. California was admitted to the Union as a state in 1850. But it should be noted that prior to the War, Pío de Jesús Pico IV, the last governor of Alta California, as with a significant number of influential Californios, was in favor of British annexation. a "War of Extermination" against the indigenous population would be necessary because of the "faithless and treacherous character of those at the head of our Indian enemies." Then, of course, Americans fought a civil war as 13 of the 30 states wanted to not be part of the United States. And that included the entire Gulf of Mexico U.S. coastline and ⅔rds of the U.S Atlantic coastline. After that Alaska was purchased from Russia in 1867. That leaves the last Pacific State - Hawaii. A Kingdom run by indigenous Pacific Islanders until 1887, the U.S. military leased Pearl Harbor for a military base. Then some wealthy white families from the United States displaced the ruling monarchy and formed a Republic after setting up barriers to voting that disenfranchised the majority indigenous and Asian populations. Hawaii became a U.S. territory in 1898 during the Spanish-American War. In passing, it should be noted the after the Spanish-American War, in 1898 Spain ceded the Philippines to the United States. Keep this in mind, because as explained later, in 1565 hundreds of Manila galleons began sailing from the Philippines in Asia to New Spain, establishing a trade pattern that has continued for 450 years. If by now it hasn't entered your consciousness, you should notice the number of times words involving Spain and Mexico appear above highlighted. 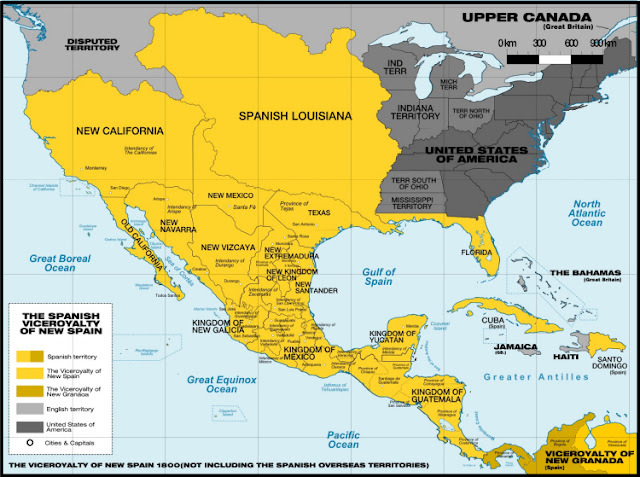 That is to emphasize the importance of the Spanish in the history of the western side of the area we call the Continental United States. But you probably were fully aware of that since the United States launched two foreign wars in the 19th Century - the Mexican-American War and the Spanish-American War. Your history books taught you that Jefferson's successors wanted to gain access, and ultimately control of, the Pacific Ocean by occupying Alta California after starting the Mexican-American War and Hawaii and the Philippines after starting the Spanish-American War. 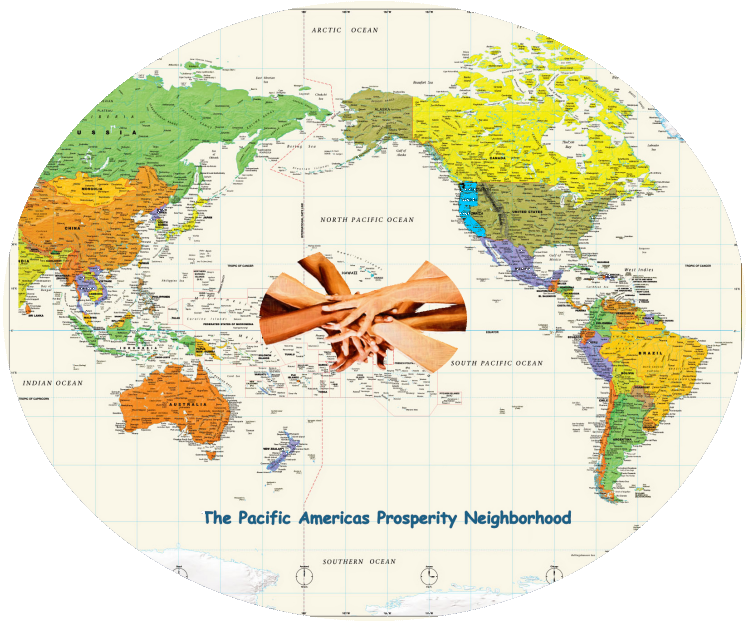 "PACIFIC" as in "Pacific States" reflects a worldview - about the weather, ecology, history, economy, and people - that derive from living in the Pacific States of Hawaii, Washington, Oregon, and California. Additionally, it is an economic worldview created by the Spanish guided by nature. The Pacific States have coastlines along the North Pacific Subtropical Gyre, the largest ecosystem on Earth, located between the equator and 50° N latitude, and comprising about 8 million square miles. Most Americans don't know what the Kuroshio Current is, much less why it is important. That is because it is critical to understanding the economic history of the Pacific States, so that history not taught in U.S. public schools. In 1620 about 100 Puritan Separatist Pilgrim religious bigots settled the Plymouth Colony arriving on the Mayflower at what is now Cape Cod Bay, Massachusetts. That was 100 years after Ferdinand Magellan discovered the Philippine Islands. And the Mayflower was 55 years after Miguel López de Legazpi established the first Spanish settlement in the Philippine Islands in 1565 seeking to develop trade between the East Indies and the growing Catholic Spanish colonies in the Americas across the Pacific Ocean. In 1565 the Manila-Acapulco galleon trade finally began when Spanish navigators Alonso de Arellano and Andrés de Urdaneta discovered the eastward return route. 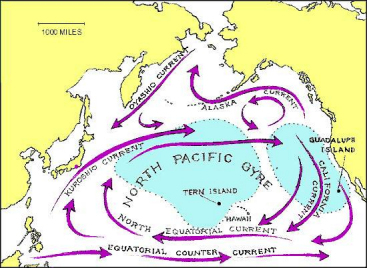 Reasoning that the trade winds and currents of the Pacific might move in a gyre as was the case in the Atlantic, they sailed north to the 38th parallel off the east coast of Japan, before catching the Kuroshio Current and winds that would take them back across the Pacific. Reaching the west coast of North America, Urdaneta's ship the San Pedro reached the coast near Cape Mendocino, California, then followed the coast south to San Blas and later to Acapulco, arriving on October 8, 1565. "Mayflower" and "Pilgrims" have been terms drilled into U.S. school curriculums. Miguel López de Legazpi and the Philippine Islands not so much. the failure of the United States to provide an adequate military defense for the Pacific States because of the North Atlantic focus of the people east of the Transcontinental Divide.